Official artwork of Tingle from The Legend of Zelda: The Wind Waker HD. Tingle (チンクル, Chinkle) is a character from The Legend of Zelda universe. 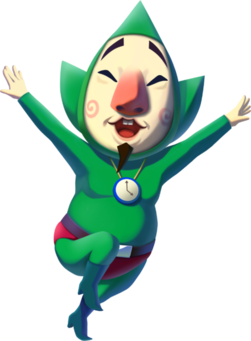 Tingle as he appears in The Legend of Zelda: Wind Waker, which his Assist Trophy in Smash Bros. is based on. Tingle first appeared in The Legend of Zelda: Majora's Mask. He is often considered one of the Zelda series' oddest and most noticeable recurring characters. Tingle is a short character that resembles a middle-aged, half-sized man dressed in a green suit. Equally as odd or perhaps more so than that is his personality, primarily his delusional insistence that he is a reincarnation of a fairy. In Majora's Mask, he was a map maker. If Link wanted a map of a certain area, he could buy a map from Tingle for a certain amount of Rupees. Whenever Link ends a conversation with Tingle, Tingle would say "Tingle, Tingle! Kooloo-Limpah", which are his supposed "magic words". Tingle later appeared in The Legend of Zelda: The Wind Waker, where he made Triforce Charts readable by saying his magic words (at the price of 398 rupees). Tingle has also appeared as the star of his own series of games consisting of Freshly-Picked Tingle's Rosy Rupeeland, an RPG with gameplay mechanics focused around buying and selling items for Rupees in order to escape to a nirvana known as Rupeeland; Ripened Tingle's Balloon Trip of Love, a point and click adventure with dating simulator elements and a plot loosely based on L. Frank Baum's Oz novels; as well as two spin-off games, Tingle's Balloon Fight DS and Too Much Tingle Pack. 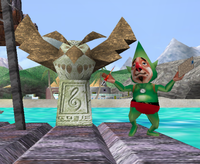 Tingle's appearance on Great Bay. Tingle, in his Majora's Mask design, appears as a stage element in the Great Bay stage. Similar to his appearances in the actual game, Tingle starts off by floating in the air with his balloon, appearing to draw another map; his balloon can also act as a temporary platform. However, if an attack hits the balloon, or if a player stands too long on it, it will pop, dealing 1% of damage to anyone directly next to it, and sending Tingle back down to the ground. After some time on the ground, Tingle will reinflate his balloon and go back up into the air, to repeat the process. Tingle can be used like an item with an Action Replay. He can only appear on the TEST stage if an Action Replay is used. As a trophy, his design from this stage is used. Tingle is a mysterious middle-aged man who thinks he's "the very reincarnation of a fairy." His bizarre behavior and unique speech are just little pieces of his vibrant personality. Tingle travels by way of a small hot-air balloon, making maps of the lands below him. Pop his balloon, and Tingle will fall to earth to sell his maps. Tingle in gameplay in Brawl. Creating a plethora of Hammers & Golden Hammers. Note that Hammers and Golden Hammers will appear even if those items are turned off. Throws Banana Peels in the air, making the whole ground slippery which results in a lot of tripping. Note that this also affects the summoner's teammates in a team battle. Characters also automatically trip upon landing. Releases lots of flowers, making the camera zoom in on the fighter who summoned him. Gives everyone Superspicy Curry status. Flies away releasing a plethora of balloons, no negative effects other than a possible minor distraction to the fighters. The Tingle Camera Glitch (discovered by Supergamesiper9) involves the camera getting stuck until the match ends. To perform the glitch, Assist Trophy and Dragoon must be on. 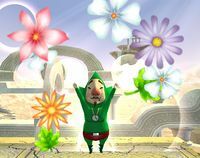 If Tingle is summoned, he must use the flower effect. Then the other player needs to collect all of the Dragoon parts. Then they need to shoot the player who summoned Tingle (the camera will be zoomed on them), KO'ing them. The camera will be stuck facing to the right until the match ends. A strange little man easily spotted by his trademark green bodysuit, bright nose, and pointy beard. Tingle has frequently appeared around Hyrule and always lets those he meets know that he's a fairy and selling homemade maps. In a recent adventure, Tingle escapes a sad and dreary life to embark on a magical adventure in the delightful, dreamlike paradise of Rupeeland. Tingle's Balloons in Super Smash Bros. for Nintendo 3DS. Tingle reprises his Assist Trophy role from Brawl, with the same functionality. Tingle's trophy is a blue item in Smash Tour. When selected, it randomly shuffles the fighters of all players including the user. Its effect can be blocked by the Proto Man item. 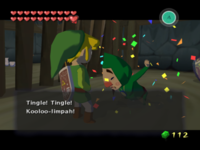 Tingle appears as a trophy in both versions of the game. The trophy can be purchased from the Trophy Shop for 300G. In Super Smash Bros. for Wii U it is part of the Ocarina of Time & Majora's Mask Trophy Box. Never seen without his green bodysuit, it's a wonder this strange little man is single at 35, isn't it? In The Legend of Zelda: The Wind Waker, he was locked up for causing trouble. In Smash Bros., he'll appear on the scene, shout "Kooloo-Limpah!" and unleash all sorts of madness. As the Great Bay stage returns in Super Smash Bros. Ultimate, Tingle does as well, behaving identically to his appearance in Melee. As such, he does not return as an Assist Trophy. Instead, he is a spirit, which uses his Majora’s Mask artwork. Hammers in Super Smash Bros. for Nintendo 3DS. Curry in Super Smash Bros. for Nintendo 3DS. Banana peels in Super Smash Bros. for Nintendo 3DS. Flowers in Super Smash Bros. for Nintendo 3DS. Tingle is one of 5 characters to have been an Assist Trophy in Brawl and Smash 4, but not in Ultimate. This is because of his role as a stage hazard. When Tingle causes the camera to zoom in as an Assist Trophy, flowers appear. This could be a reference to the box art of Freshly-Picked Tingle's Rosy Rupeeland, which depicted Tingle skipping through a woodland forest surrounded by flowers. Tingle's trophy description in Brawl is inaccurate. Rupeeland is not where Rosy Rupeeland takes place, but rather the goal of the game is to collect enough Rupees to reach Rupeeland. This page was last edited on March 19, 2019, at 12:07.